Superbike launches were the flavour of the season at the recent 14th edition of the annual Royal Enfield Rider Mania and the 5th edition of the India Bike Week maga event held in picturesque Vagatore beach front in golden Goa. Major motorcycle brands such as the iconic Royal Enfield, German BMW Motorrad, British Triumph Motorcycles, American brand Indian Motorcycles and the new entrant on the scene Avantura Choppers launched and showcased their new products to excite nearly six-seven thousand bikers both from overseas and India. Japanese giant Yamaha also introduced the new version of Yamaha MT-09 in New Delhi to showcase the “power of a monster” and the “agility of a roadster” to strengthen its superbike segment in the market. Royal Enfield, the global leader in mid-size motorcycle segment (250-750cc), unveiled its ground-up modern twin motorcycles, the Interceptor INT 650 and the Continental GT 650. With these two bikes the company is entering into the lucrative premium motorcycle segment in the country. Both the bikes are powered by the new 650 cc engine developed by the company. Royal Enfield, which will sell these two bikes in India early next year, claims that these two bikes pack a punch and accessible to Royal Enfield bike owners. It means the new bikes will be priced lower than their closest competitor like Harley Davidson Street 750 and Triumph Bonneville, which cost upward of Rs 5.14 lakh. “We are not competing with other brands or companies. Our own products are the benchmarks for us,” Sidhartha Lal, the 43-year-old dynamic CEO of Royal Enfield, said during the unveiling event. “These new biked will be priced keeping the same margin that is currently between the prices of the 150 cc and 350 cc models,” he said. Equipped with 47 bhp of power and 52 Nm of torque, the two new bikes also boast of futuristic technologies, such as parallel-twin cylinder with electronic fuel injection, twin exhausts and an all new six-speed gearbox with a slip-assist clutch. “We have at present over 2.5 million active riders across the country and they need to upgrade themselves to a higher motorcycle with more power and these two new bikes will just do that,” Rudratej Singh, president at Royal Enfield told Financial Chronicle. 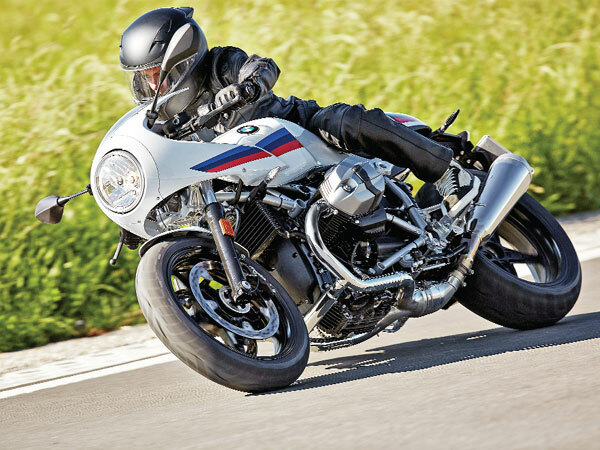 The R NineT Racer is the latest addition to BMW’s Heritage family of classic, and retro-inspired bikes with boxer-twin engines. It features a retro front cowl with a round headlamp and a laid back windscreen. The 17-litre fuel tank looks bulbous and gets knee recesses that extend into the small and thin saddle. A hump at the tail is the final finishing curve on the bike. The bike comes with three-tone graphics on top that are reminiscent of BMW Motorsport’s colour scheme. The R NineT Racer will compete against the Triumph Thruxton R and the upcoming Kawasaki Z900RS Cafe. The BMW K 1600 B is a sporty bagger. Baggers are essentially touring motorcycles that are very similar to cruisers and have a boxy saddlebag on top of them that essentially look like an extension of the bike themselves. Baggers are quintessentially an American genre of bikes and the new K 1600 B is a German interpretation of it. The K 1600 B gets a chopped windscreen and tubular handlebars with a massive 26.5 litre fuel tank, all of which will be a boon while touring. The seats are low-set and two 37-litre hard saddlebags sit on either side of it. Two chrome mufflers sit below the boxy panniers. Despite its proportion, it’s been designed beautifully. It looks sleek and rich with its free flowing bodywork. The bike gets a 6-cylinder, liquid-cooled, 1649cc engine that churns out 162PS of power at 7750rpm and 175Nm of torque at 5250rpm. A 6-speed gearbox is used for transmission duties. It also gets an optional reverse gear. The K 1600 B competes against the 2017 Honda Gold Wing. With its motto ‘Make Life a Ride’, the pavilion showcased a range of 14 BMW Sports, Tour, Roadster, Heritage or Adventure bikes from its stable. “At BMW Motorrad, we have been crafting not only masterpieces of engineering, but experiences that are above and beyond the ordinary. We are thrilled to bring BMW Motorrad to India Bike Week, presenting our fans the very essence of our brand motto ‘Make Life a Ride’,” Vikram Pawah, president st BMW Group India, said. Rival Triumph Motorcycles also unveiled an exciting new bike called the Bonneville Speedmaster, the cruiser, for the Indian market. It will be launched in the country by April 2018 with an expected price of Rs 10-11 lakh. The retro cruiser was first unveiled at the company's headquarters in Hinckley, UK, last month. The Bonneville Speedmaster packs the same engine that is on the Bonneville T120 and the Bobber. This 1200cc, liquid-cooled, parallel-twin engine in its HT (or High Torque) configuration makes 77PS of power at 6100rpm and 106Nm of torque at 4000rpm. It is mated to a 6-speed gearbox. The Speedmaster also gets a ride-by-wire throttle for enhanced response, two riding modes – Road and Rain, and switchable traction control as well as cruise control.